It seems that attention spans are shorter and less focused than ever, making our job as instructional designers even more challenging. Effective e-learning needs to be engaging enough that learners will want to take the time for it, and yet substantial enough for learners to recall and apply later. As such, instructional designers must use the powers of imagination and persuasion to make a wide range of content “memorable” for learners. One surefire way to make something more memorable is to make it more meaningful. For e-learning, this means designing content that is concise, relevant, tangible, and personal. Start by asking questions. Instead of a tedious setup (i.e., opening titles followed by navigation, objectives, an introduction, etc. ), use questioning to immerse learners in a case study or an engrossing real-life, interactive scenario. Asking questions is intellectually and emotionally stimulating; it grabs a learner’s attention and immediately engages them in problem-solving. Use more showing and less telling. Demonstrate steps with a short how-to video or a screencast and then give learners the chance to practice applying those steps hands-on with a simulation. Demonstrate the value early. People are more apt to focus on information when they see that it has value in their everyday life. Use a quiz, a self-assessment survey, or a compare and contrast exercise at the start of your course to challenge your learner’s assumptions about your topic and grab their attention. Let learners hear from their peers. Most people pride themselves on doing good work and contributing to their teams. Hearing from others who’ve successfully applied what they’ve learned in training can foster a healthy sense of competition—and it can be a nice way to demonstrate the relevance of the information you’re sharing. 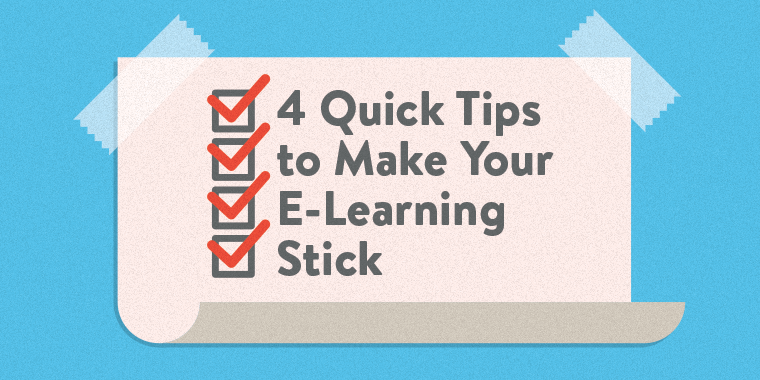 Sometimes the key to making your e-learning more memorable is knowing which information to emphasize first. There are many ways to approach organizing your content for learning, but one way is to put the most critical information front and center, followed by progressively less critical information. 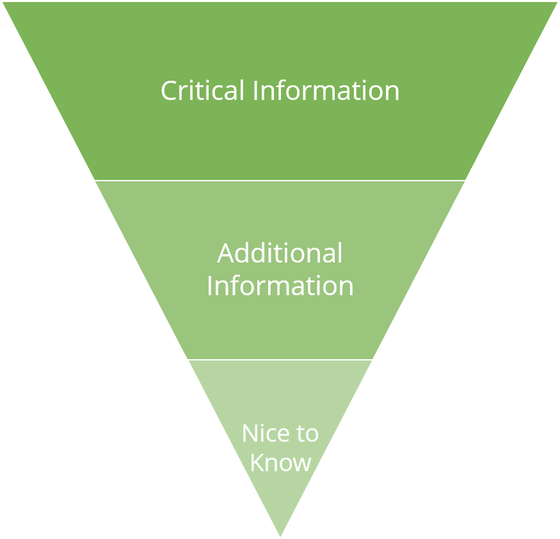 This structure can help you prioritize information and minimize the nice-to-know details that can add unnecessary bulk to your course. Particularly for longer courses, where learners might lose steam, this approach helps you be sure that the essential information is communicated right from the start. If you’ve ever explained a foreign concept to someone by comparing your idea with something more familiar, then you’ve used an analogy. Analogies are great for helping learners connect new ideas with information they already have. Making these connections, in turn, increases the chances they’ll remember what you’re sharing with them. For example, if you were trying to teach someone about how a tornado forms, you might compare it to the way water spins as it goes down the drain. Water spinning down a drain is a simple, relatable concept and a good starting point for talking about the forces of nature at work. We are hardwired to look for visual patterns. That’s because visuals are easier to digest than large blocks of text. When it’s time to design your e-learning, think about ways you can visually present information that are something other than traditional course text. Supporting your key points with strong visuals—either static or interactive—could be all you need to achieve your objectives and create a lasting impression. What techniques do you use to help learners retain their learning? Share them with the community by leaving us a comment below. I have to agree with this sort of thinking. We have tried to cut our elearning modules down and make them "quicker" for staff to complete. We have also improved our use of brief video clips and lots of pictures that are specific to the topic and when ever we can - they are our people in our facilities and work sites. One challenge is to deal with the fact many staff have to try and do elearning assignments while 'on duty' and are thus often forced into doing very small chunks of a module at a time. To work with that we try to build "chapters" or related topic segments into the presentation whenever we can. This is good. I particularly like it because it aligns very neatly with what the Heath brothers preach in their book Made to Stick (if you haven't read this yet, I highly recommend it, along with another one of their books, Switch: How to Change when Change is Hard). Thanks for this article! I use a technique that I call, "I'll tell you, I'll show you, now you do it," where I will add a quiz question that will involve the user opening/logging into the tool I'm training, and require them to find do a scavenger hunt exercise based on the process I just described. So, they have to go outside the course to use the tool I'm describing, then enter the answer to continue.